Celebrating 10 years with Mr T on Anzac Day this week, we decide that instead of blowing hundreds of dollars on fine dining (we’ll save that for a certain person’s 40th later this year!) we’ll spend the day cycling to the newly refurbished MCA and visit various food outlets along the way. We start at Double Roasters, a ridiculously popular cafe, given how recently it opened, on Victoria Road, Marrickville, a mere two minutes cycle ride from our house. While we peruse the menu, Mr T has a Belgian hot chocolate, made with real dark chocolate, which is the only way to make it as far as he’s concerned. 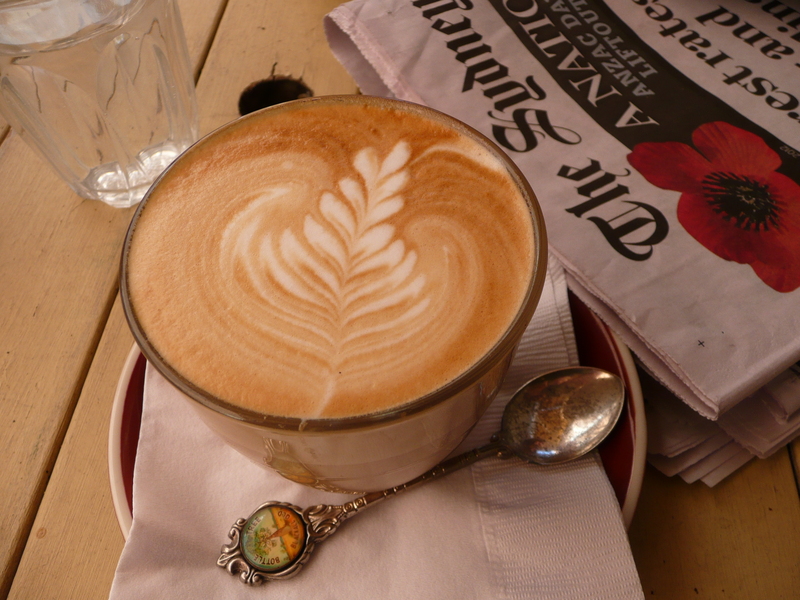 I have a latte which is creamy and smooth, made from beans that they roast on the premises. 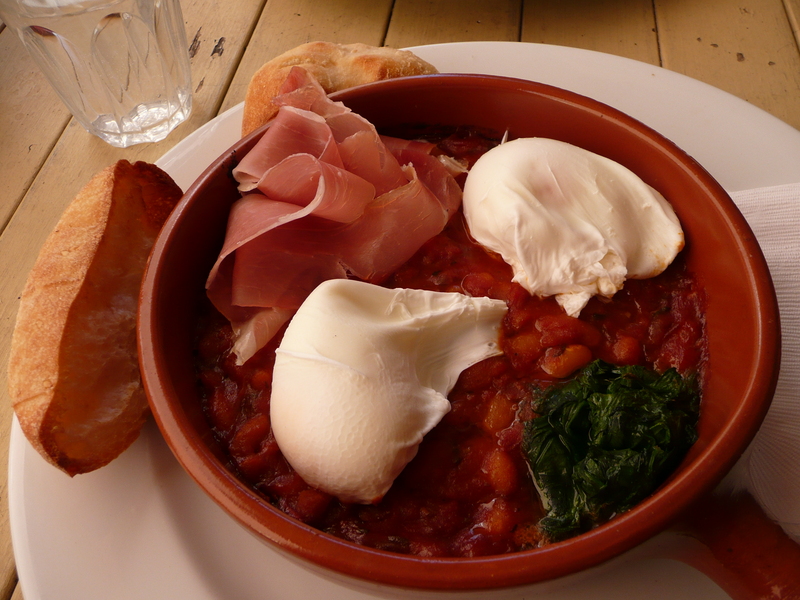 To eat I choose ‘baked eggs’ with homemade baked beans, prosciutto and spinach which comes in a rustic earthenware dish. It’s not really baked eggs as I’ve had it before since they are in fact poached and come sitting atop the sea of beans. However, I’m not complaining because they’re perfectly cooked and their deep yellow insides ooze out when I stab them with my knife. The beans are sweet, herby and richly tomatoey and the prosciutto lends a lovely saltiness to the whole combo. My only complaint is that there’s not enough of the toasted roll to mop it all up and the spinach is a bit token in quantity. 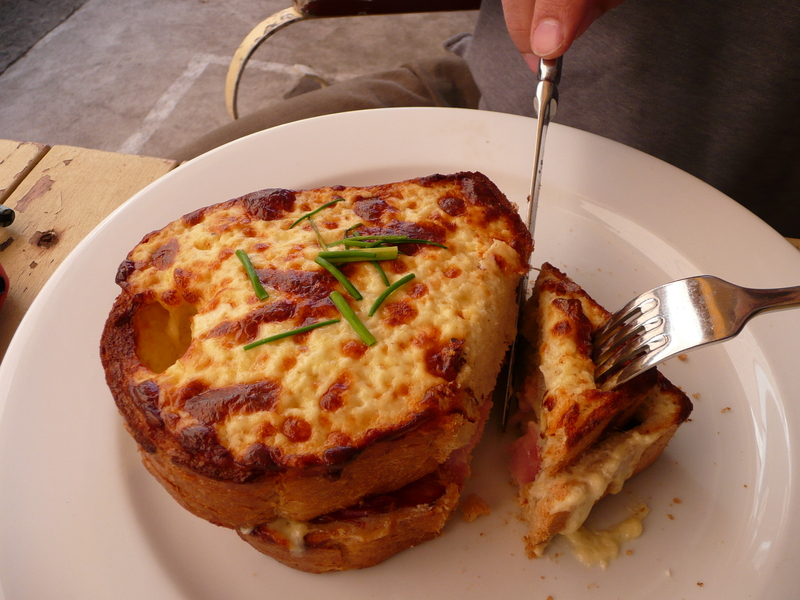 Mr T has the Croque Monsieur which is two very thick slices of spongy white bread sandwiched with good quality ham and Gruyère cheese, topped with plenty of Gruyère cheese sauce browned under the grill – delicious! 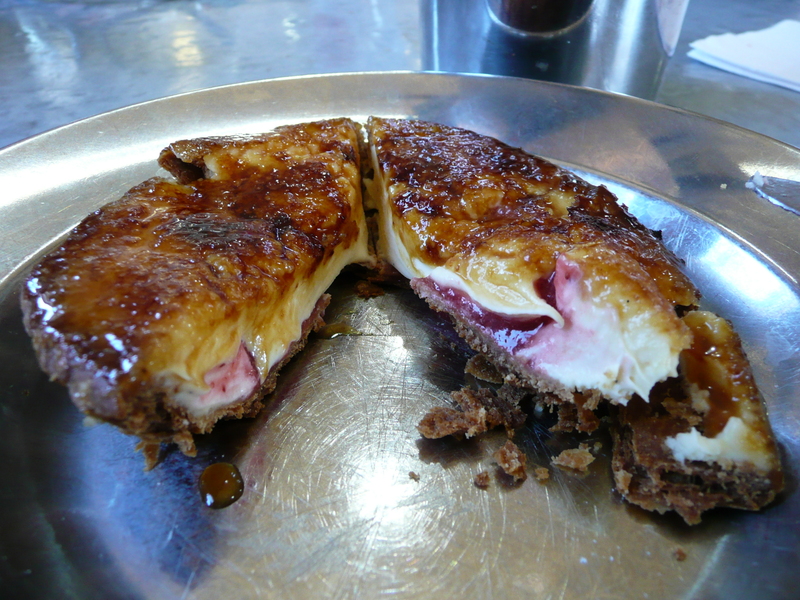 Feeling guilty at not going to our favourite Marrickville cafe, Mr T persuades me that we should also pop in to Bourke Street Bakery, just around the corner, so they don’t feel left out. 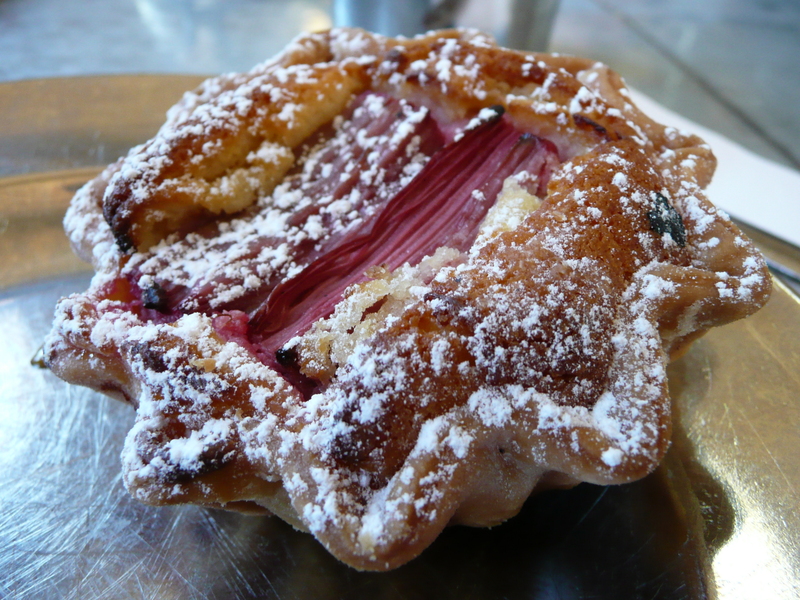 We share two delectable tarts with perfect pastry – rhubarb and almond, and strawberry crème brulée. Suitably replete, we cycle on our way to The Rocks to visit the MCA, and afterwards, in need of a sundowner, we head to the new Sydney Theatre Company bar, The Bar at the End of the Wharf. I like the rustic beach-house feel of the decor but I’m sorry to say that the barman, while friendly and willing, is not very capable when it comes to my order of a Manhattan and a mocktail. Nonetheless, we enjoy ourselves playing some table tennis on one of the covered outdoor deck areas. Now dark, we make our way over to Darlinghurst to try a new place for dinner that I’ve read good things about – Buffalo Dining Club. We sit upstairs in a cosy space that fits only five small tables and Peter, one of the three owners, looks after us magnificently. He brings me a festive glass of Perrier Jouët in a beautiful matching glass and tells us about the menu. 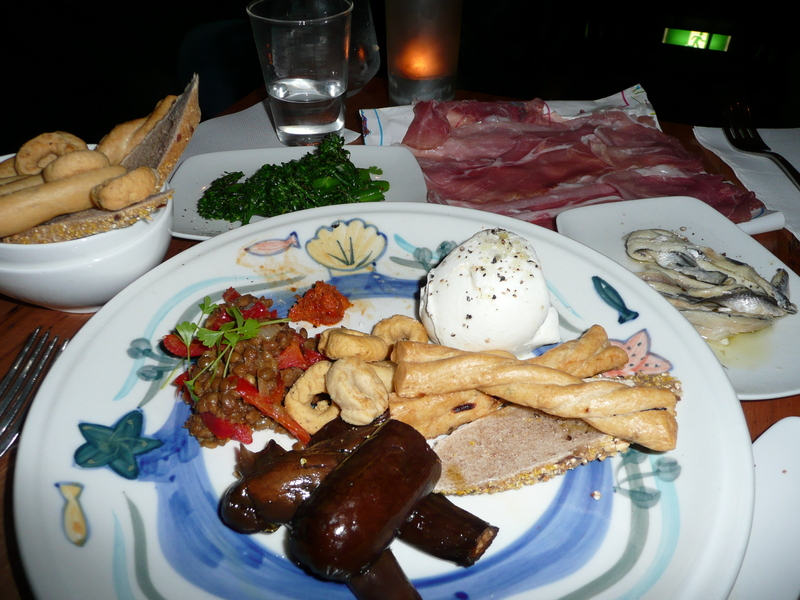 This is a buffalo mozzarella bar, a craze started in Rome in 2004. The mozza is the real deal, flown in three times a week direct from Naples, and the rest of the menu is all about what complements this delicate, milky, pillowy cheese. A globe of mozzarella comes with two side dishes but we can’t choose just two so we get four – beautiful chargrilled baby aubergines, mildly spicy braised lentils, crisp garlicky broccolini and tart white anchovies. Also accompanying the mozzarella are bowls of thinly sliced, firm, nutty bread and various types of crunchy, savoury biscuit. To complete the picture we order 60g of San Daniele prosciutto, so moist and wafer thin that it pulls apart a bit like fairy floss. The whole experience is quite heavenly – the quality of the produce and the combination of flavours are a delight. For lubrication, when the bubbles are gone, I sip a delicious, well-chilled glass of Howard Park SB from Margaret River. We had planned to follow up with the buffalo ricotta gnocchi with tomato sugo but decide a modicum of restraint is called for, especially given the hills we have to cycle up to get home! But I console myself that this is definitely not the last time we’ll be coming here.